Rash Behari Bose ( pronunciation (help·info); Bengali: রাসবিহারী বসু Rashbihari Boshu; 25 May 1886 – 21 January 1945) was an Indian revolutionary leader against the British Raj and was one of the key organisers of the Ghadar Mutiny and later the Indian National Army. Rash Behari Bose handed over Indian National Army to Subhas Chandra Bose. Rash Behari Bose was born in village Subaldaha, Purba Bardhaman district, in West Bengal. His father's name was Binod Behari Bose. Bhubaneswari Devi was his mother. Tinkori Dasi was Rashbehari Bose's foster mother. The major part of the childhood of Rashbehari Bose and Sushila Sarkar was spent in the village Subaldaha. They lived in this village at the house of madam Bidhumukhi. Bidhumukhi was a widow from her early life. Bidhumukhi was the sister in law of Kalicharan Bose. His early education was completed under the supervision of his grandfather Kalicharan Bose at village Pathsala (Presently Subaldaha Rashbehari Bose F.P School) at his birthplace. Rash Behari Bose got an education of Lathi Khela in his child at Subaldaha. He got inspiration of revolutionary movement hearing stories from his grandfather at his birthplace Subaldaha. He was the cynosure of all villagers. His nickname was Rasu. He was stubborn and the villagers loved him very much. It is heard from villagers that he was at Subaldaha till he was 12 or 14 years old. His father, Binod Behari Bose, was stationed in Hooghly district for few years. . Bose studied in Dupleix College with his friend Shrish Chandra Ghosh. The principal Charu Chandra Roy inspired them into revolutionary politics. Later he joined "Morton school" in Kolkata. Bose later earned degrees in the medical sciences as well as in Engineering from France and Germany. He was interested in revolutionary activities from early on in his life, he left Bengal to shun the Alipore bomb case trials of (1908). At Dehradun he worked as a head clerk at the Forest Research Institute. There, through Amarendra Chatterjee of the Jugantar led by Jatin Mukherjee (Bagha Jatin), he secretly got involved with the revolutionaries of Bengal and he came across eminent revolutionary members of the Arya Samaj in the United Provinces (currently Uttar Pradesh) and the Punjab. Originally Rash Behari Bose stay few years in Hooghly district, West Bengal. Following the attempt to assassinate Lord Hardinge, Rash Behari was forced to go into hiding. 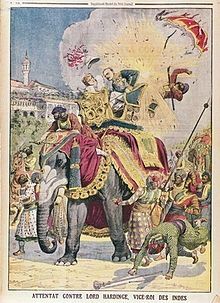 The attempt was made on 23 December 1912 in Delhi when Lord Hardinge was in a ceremonial procession transferring the capital from Calcutta to New Delhi. He was attacked near the Red Fort by Basanta Kumar Biswas a disciple of Amrendar Chattarjee, but missed the target and failed. The bomb was made by Manindra Nath Nayak. Bose was hunted by the colonial police due to his active participation in the failed assassination attempt (actually Bose's aim was to prove to the world that Indians do not accept the subjection of his country to foreign rule by consent, but by force of military power, which was successful. Otherwise, he had no personal enmity with Lord Hardinge) directed at the Governor General and Viceroy Lord Charles Hardinge in Delhi. He returned to Dehra Dun by the night train and joined the office the next day as though nothing had happened. Further, he organized a meeting of loyal citizens of Dehradun to condemn the dastardly attack on the Viceroy. Lord Hardinge, in his My Indian Years, described the whole incident in an interesting way. During the flood relief work in Bengal in 1913, he came in contact with Jatin Mukherjee in whom he "discovered a real leader of men," who "added a new impulse" to Rash Behari's failing zeal. Thus during World War I he became extensively involved as one of the leading figures of the Gadar Revolution that attempted to trigger a mutiny in India in February 1915. Trusted and tried Ghadrites were sent to several cantonments to infiltrate into the army. The idea of the Gadar leaders was that with the war raging in Europe most of the soldiers had gone out of India and the rest could be easily won over. The revolution failed and most of the revolutionaries were arrested. But Rash Behari managed to escape British intelligence and reached Japan in 1915. Bose fled to Japan in 1915, under the alias of Priyanath Tagore, a relative of Rabindranath Tagore. There, Bose found shelter with various Pan-Asian groups. From 1915–1918, he changed residences and identities numerous times, as the British kept pressing the Japanese government for his extradition. He married the daughter of Aizō Sōma and Kokkō Sōma, the owners of Nakamuraya bakery in Tokyo and noted Pan-Asian supporters in 1918, and became a Japanese citizen in 1923, living as a journalist and writer. It is also significant that he was instrumental in introducing Indian-style curry in Japan. Though more expensive than the usual "British-style" curry, it became quite popular, with Rash Bihari becoming known as "Bose of Nakamuraya". Bose along with A M Nair was instrumental in persuading the Japanese authorities to stand by the Indian patriots and ultimately to officially actively support the Indian independence struggle abroad. Bose convened a conference in Tokyo on 28–30 March 1942, which decided to establish the Indian Independence League. At the conference, he moved a motion to raise an army for Indian independence. He convened the second conference of the League at Bangkok on 22 June 1942. It was at this conference that a resolution was adopted to invite Subhas Chandra Bose to join the League and take its command as its president. The Indian prisoners of war captured by the Japanese in the Malaya and Burma fronts were encouraged to join the Indian Independence League and become the soldiers of the Indian National Army (INA), formed on 1 September 1942 as the military wing of Bose's Indian National League. He selected the flag for the Azad Hind movement and handed over the flag to Subhas Chandra Bose. But although he handed over the power, his organizational structure remained, and it was on the organizational spadework of Rash Behari Bose. Rash Behari Bose built the Indian National Army (also called 'Azad Hind Fauj'). Prior to his death caused by tuberculosis, the Japanese Government honored him with the Order of the Rising Sun (2nd grade). Bose met Toshiko Soma when he was hiding at her house in Shinjuku City. She was the daughter of Aizō Sōma and Kokkō Sōma, the owners of Nakamuraya bakery(ja:中村屋) in Tokyo and noted Pan-Asian supporters in 1918. At that time, Bose was a fugitive with the British searching for him. Their initial contact was during those intense moments of hiding though without any interactions. In 1916, when Bose was a fugitive no more, he invited the Soma family to his house as a gesture of gratitude. That was the first instance of their interaction in a social context. However, Bose stuck out like a sore thumb in Japan. People would consider them with suspicion. Mitsuru Toyama, as a solution proposed to the Soma's a marriage between Toshiko and Rashbehari. He thought that marriage with a Japanese citizen would make it easy for Bose to apply for citizenship. Despite their initial reservations, the Soma's agreed to the match. When, they asked for Toshiko's consent, she took three weeks to decide. They had a happy marriage that lasted for eight years. Bose taught Toshiko Bengali and how to wear a sari. Bose got Japanese citizenship in 1923. Toshiko's health declined soon after and it claimed her life in 1924. After her death, he never remarried. They were buried together after Bose's death. They had two children together. Masahide Bose (Bharatchandra) was born in 1920. He died in World War II aged 24. Their daughter Tetsuko was born in 1922. A dinner party given to Bose in his honour by his close Japanese friends, including Mitsuru Tōyama, a right-wing nationalist and Pan-Asianism leader (centre, behind the table), and Tsuyoshi Inukai, future Japanese prime minister (to the right of Tōyama). Behind Tōyama is Bose. 1915. ^ Uma Mukherjee (1966). Two great Indian revolutionaries: Rash Behari Bose & Jyotindra Nath Mukherjee. Firma K. L. Mukhopadhyay. p. 101. ^ Uma Mukherjee (1966). Two great Indian revolutionaries: Rash Behari Bose & Jyotindra Nath Mukherjee. Firma K. L. Mukhopadhyay. p. 119. ^ a b c d বন্দ্যোপাধ্যায়, পারিজাত. "বাংলা থেকে রান্না-শাড়ি পরা, জাপানি বউকে শিখিয়েছিলেন রাসবিহারী বসু". anandabazar.com. Retrieved 27 July 2018. This page was last edited on 10 March 2019, at 21:18 (UTC).